Irish soda bread in scone form! These Irish Soda Bread Scones are fluffy, lightly sweetened, filled with plump golden raisins, and pair perfectly with some butter and jam! I lied! 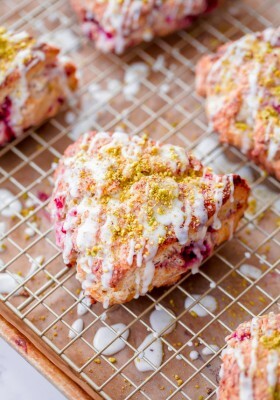 These Irish soda bread scones are as festive as we get around here for St. Patricks Day. Honest truth? I was busy testing recipes on Tuesday and the idea for these scones came to me completely out of the blue. My creative energy seems to come in waves these days. I either can’t think of anything or I’m able to come up with an entire page’s worth of ideas. One or the other. There is no balance these days. The good news? The scones turned out exactly as I’d hoped they would! I couldn’t wait to share them with you! Ok, so let’s clear things up right off the bat. These are not traditional by any means. I mean, technically these are more similar to British tea scones than Irish soda bread, but the ingredient list is very similar. These are basically an Americanized, slightly sweet version of Irish soda bread in scone form. A hybrid of a buttermilk biscuit and a buttermilk scone if you will. But lighter and different in texture to my standard cream scones. Am I making any sense at all? If you’ve ever tasted a traditional English scone (a good one! ), they taste very similar to those! Slightly sweet and lightly studded with golden raisins. I’ve mentioned this a few times on the blog before, but I used to travel to England every summer growing up. I would visit my grandmother, who lived in Cornwall, for weeks at at time. 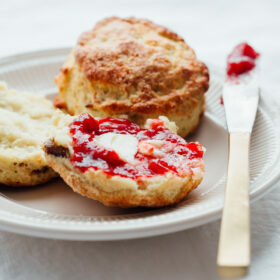 I realize it is blasphemy to even mention England in a post about Irish soda bread scones, but hear me out. Cornwall is famous for their high teas. High tea occurs in mid-to-late afternoon and consists of a plethora of tea sandwiches, cakes, petit fours, and scones. The scones are almost always accompanied by clotted cream and various jams! It seems to vary, but many classic British scones contain raisins, which I personally don’t mind. Or, as my grandmother says, “sultaaaaanas” [translation: sultanas]. I know most people are either firmly in the hate, love, or tolerate raisin camp – but I have a feeling people wouldn’t hate raisins as much if we called them sultanas. Sounds much more elegant and refined, right? 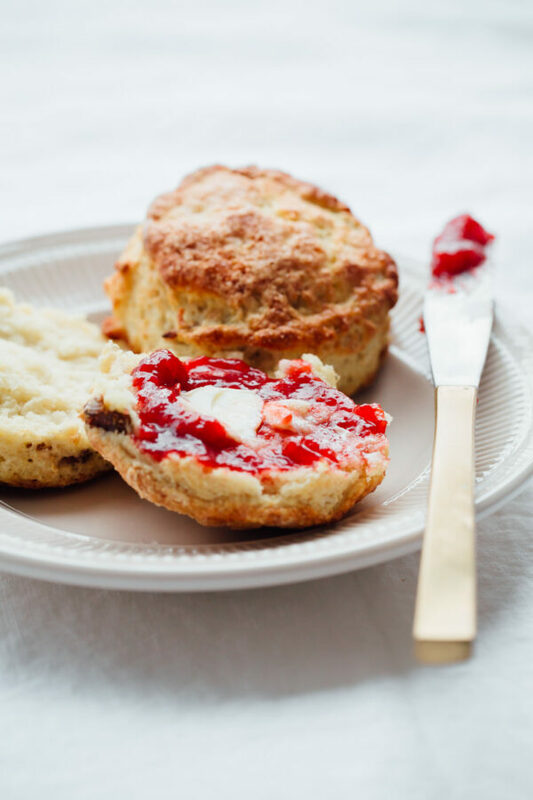 Unlike traditional Irish soda bread, which is known for being slightly dense, theses Irish soda bread scones are lighter in texture and great with butter and jam for breakfast, a snack, and, of course, afternoon tea. The scones also only take about 30 minutes to prepare start to finish – and the best part? Unlike Irish soda bread, you don’t have to wait for these to cool at all. 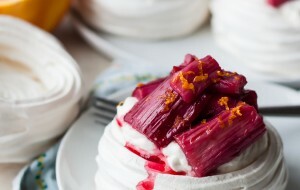 In fact, they are much tastier when sliced and served warm from the oven. The scones are best served the day of baking, but can easily be reheated and refreshed in the oven for 10 to 15 minutes. 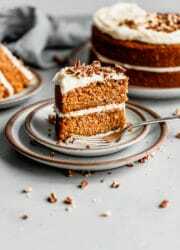 It is a great recipe to keep on hand for those times when you need to use up any leftover buttermilk or want a last-minute baked good to gift to friends or family! 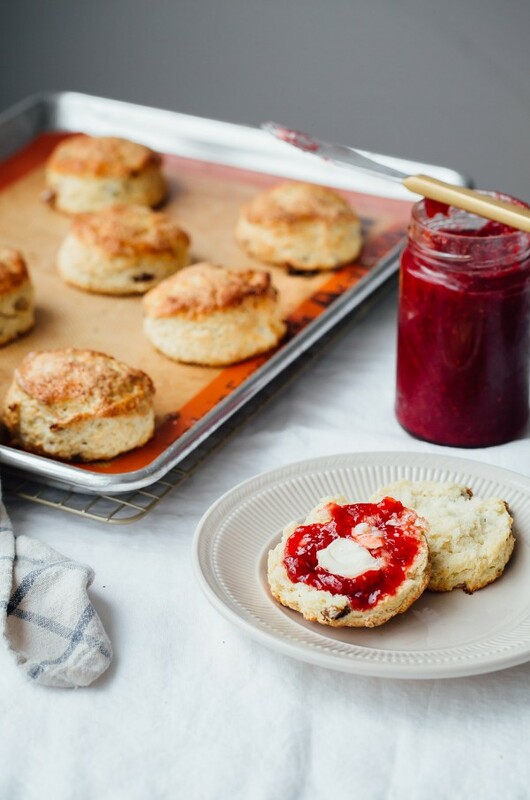 I’m totally imagining a nice basket lined with a pretty linen, a pile of these scones, and a jar of really nice jam! Instant comfort food. Preheat the oven to 425 degrees Fahrenheit (220 degrees Celsius) with a rack in the center position. Line a sheet pan with parchment paper (or a silicone baking mat). Set aside. In a medium mixing bowl, whisk together the flour, sugar, baking powder, baking soda, and salt. Add the cold butter and toss in the flour mixture. Using a pastry cutter or a fork, cut the butter into the flour mixture until the mixture resembles coarse meal. Place the bowl in the freezer for 5 minutes to chill. In a large measuring cup, whisk together the cold buttermilk and egg. Prepare the egg wash: In a small bowl, whisk together the egg and milk. Set aside. Remove the flour mixture from the freezer. Stir in the golden raisins. 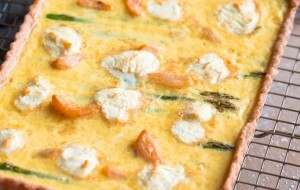 Create a well in the center of the dry ingredients and add the buttermilk. Using a wooden spoon, stir the buttermilk into the flour mixture until just absorbed. The dough will seem shaggy and slightly dry. Transfer the dough and any dry remaining bits to a lightly-floured countertop. Knead the dough 4 to 5 times until it comes together, dusting the dough lightly with flour as necessary to prevent it from sticking to the countertop. Pat the dough gently with your hands into a disc that is roughly 3/4-inch thick. Fold the dough over itself 2 to 3 times, this will help create layers. 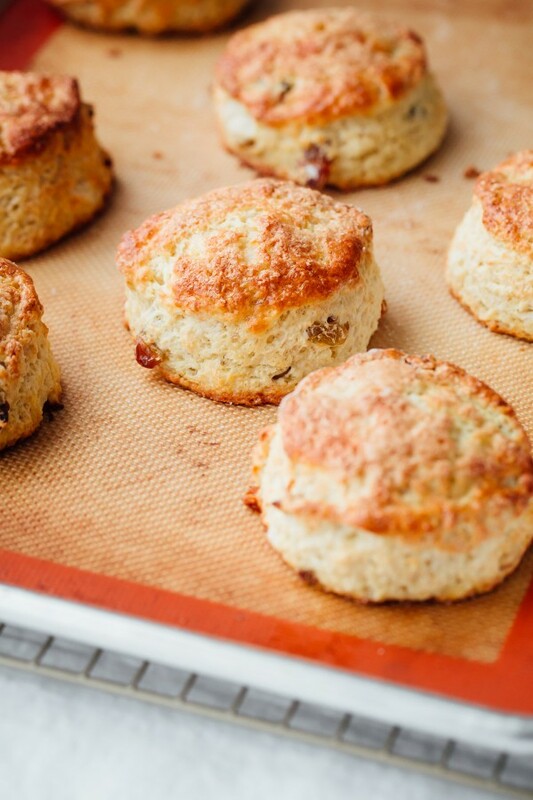 Dip a 2.5-inch-diameter biscuit cutter in flour and cut out the scones. 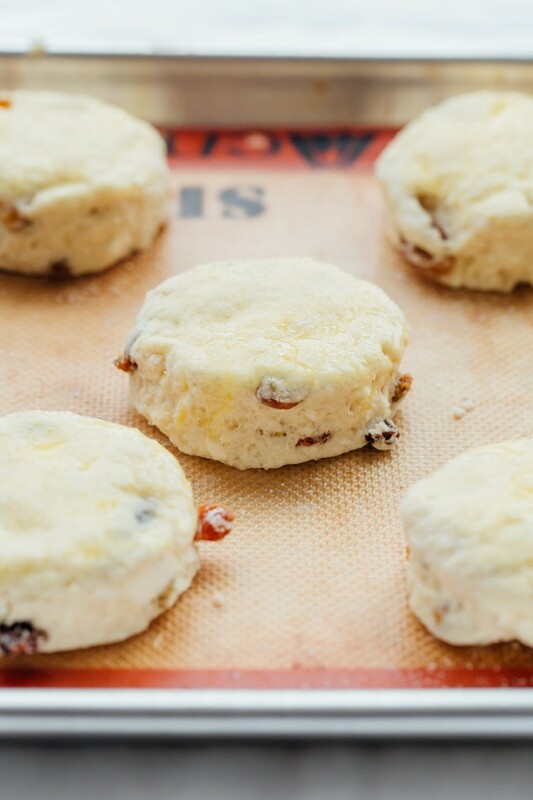 Do not twist the biscuit cutter as you cut the dough, this will prevent the scones from rising evenly. Gently press and knead any remaining scone dough and repeat to make 8 scones total. 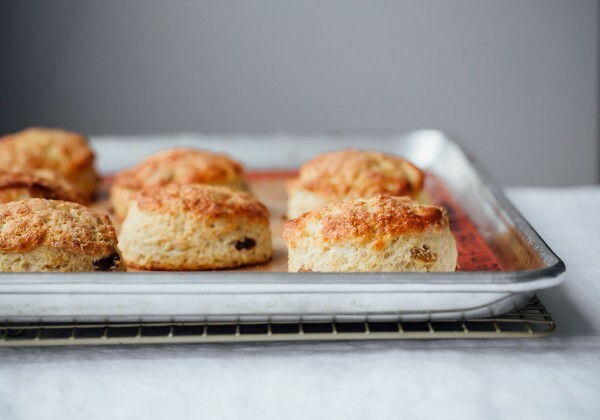 Distribute the scones evenly on the lined sheet pan, setting them apart by several inches. Lightly brush the tops of the scones with egg wash and generously sprinkle with granulated sugar. 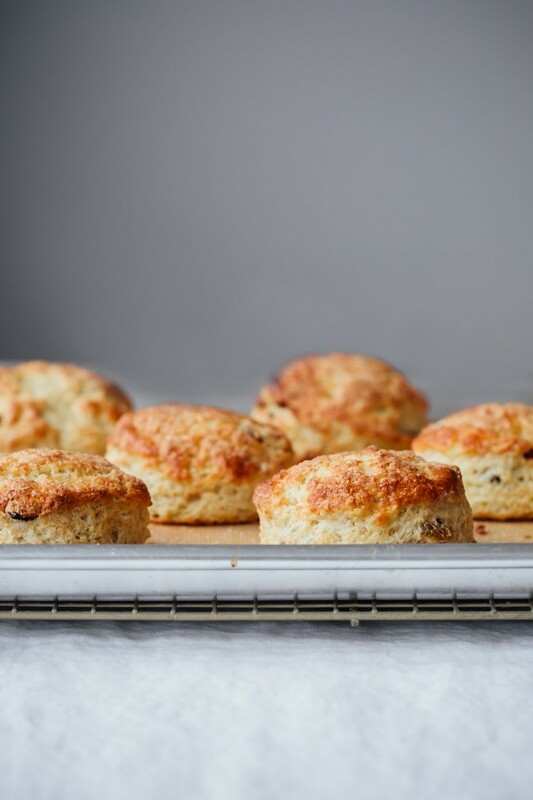 Place the scones in the oven and immediately increase the oven temperature to 450 degrees Fahrenheit (230 degrees Celsius). Bake until golden, about 10 to 12 minutes. Transfer scones to a wire rack. Slice and eat warm with butter and/or jam. Scones best served the day of baking. Scones can be reheated in a 325 degree Fahrenheit oven (160 degrees Celsius) for about 10 minutes, or warmed briefly in the microwave – if you’re desperate! 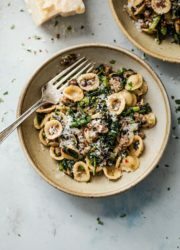 These look really good, I want to make them! Maybe on Easter weekend. I love Irish soda bread so much! Making the dough into scones is a genius twist on the classic – yum! Ahh Laura, you’re a genius! 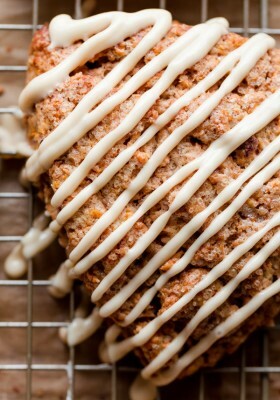 What a fun idea to combine traditional Irish soda bread and scones. So neat that you used to go to England all the time – it’s such a magical place! I could seriously eat clotted cream by the spoonful, ugh. So delicious. 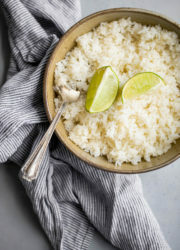 Genius solution for leftover buttermilk indeed! Would love to make a fig & pig variant! I want to make them too! And your right, there is always leftover buttermilk! Delicious, and i have some great new jams to try them with! My mouth was watering thinking about all those lovely “cream teas” we had in Cornwall! They look perfect, and delicious! 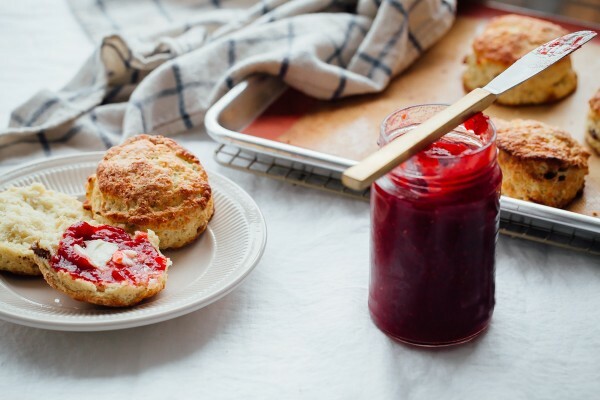 I love a good scone with some jam, it’s one of my favorite breakfasts 🙂 I’m also in love with the fact that they only take 30 minutes… time is EVERYTHING lately over here so you are winning in my eyes with these! Omg, Yes please! These could be very dangerous things! 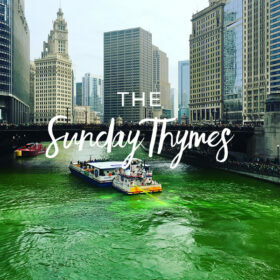 Now this is a way to celebrate St Pats! Delish! 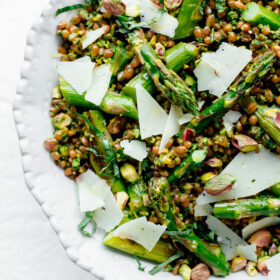 I can’t wait to make these for Easter Brunch! Can I make the dough ahead of time – either a day & leave in the fridge, or a week & put in the freezer? Thank you! Hi Meg! I haven’t done this with this specific recipe, but I generally have great luck with making biscuit/scone dough, freezing the dough (unbaked), and then popping it in the oven! 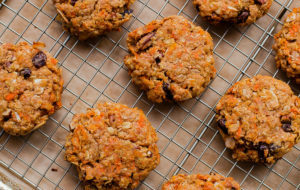 So, I would roll the dough out, shape the biscuits, DO NOT brush them, pop them on a tray or cookie sheet, place in the freezer until totally frozen (then you could transfer them to a freezer bag to save space). Then you can put the frozen scones on a sheet pan and brush them with egg wash/sugar just before baking. They might take a tiny bit longer to bake but this should work! Hope this helps! I don’t know. I think talking Irish soda bread and scones would be the blasphemous part. But honestly, I don’t think any of this is blasphemous at all! I spent years living in London and spent a lot of time in Ireland and think this would be welcomed in both countries with open arms and mouths! I want one of these warm and slathered in butter and honey with a nice strong cuppa. 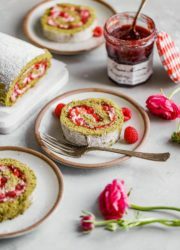 I’m from Central Europe and I have a small question about “buttermilk” in this recipe. Do you mean “cultured buttermilk” – according to the article abut buttermilk at Wikipedia? Nevertheless, I tried to make scones yesterday with wholemeat wheat flour (I think it is close to your all-purpose flour) and with cultered buttermilk and it was. . . d e l i c i o u s! Thank you very much for remembering me my holiday in Ireland! Since these scones do call for some sugar, I think caraway seeds would be a little strange in these! They’re definitely more on the sweet than savory side. But you could always cut that down and make them more savory if you prefer! I have more of a question. I want to try making scones and bought a scone pan to bake them in. Resembles a ceramic pie plate, divided into 8 sections. Would this recipe for Irish soda scones work? Also, I am part of the group that cannot stand raisins, no matter what the are called!! Hmm…that’s really hard to say and I’m hesitant to advise doing that. This dough is more like a biscuit dough, so I’m hesitant to say that it work as well. I also would worry that they might not rise properly due to the restricted sides and the fact that the heat of the oven won’t he circulating around the dough as evenly. That’s just my thoughts, you’re welcome to try it, but I can only guarantee results with this method!